When making a gift online, ensure your gift is designated for the Mason School by selecting SCHOOLS and UNITS, then BUSINESS, and making a selection from the Business dropdown. The Class Gift Campaign is a student-led fundraising effort that encourages graduating students to give back to the faculty, programs, and the school that has played a key role in their development as business professionals. Our goal is to have 100 percent of the Class of 2019 giving back! You can give to any area of the Raymond A. Mason School of Business, and a gift of any size counts toward the 100 percent participation goal. You can make a one-time gift, a recurring gift, or a multi-year pledge using our online giving form. Please make a thoughtful contribution to support your program and class gift! 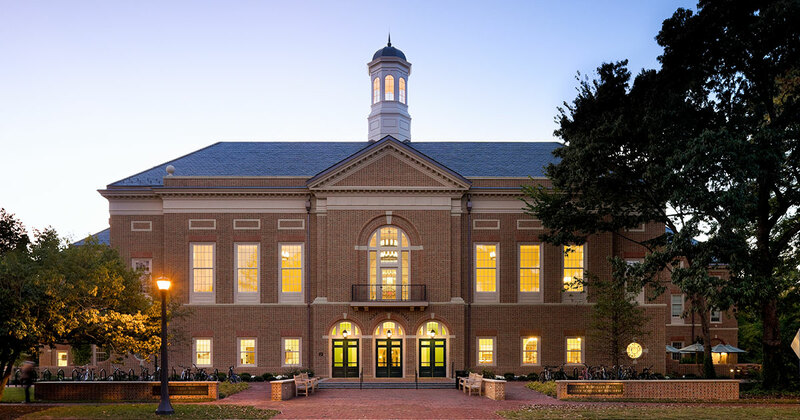 The Dean's Circle recognizes donors to the Mason School who make annual leadership gifts. These key alumni and friends allow the School to fund scholarships, student programs, faculty support and research, curricular enhancements, and career services. Dean’s Circle members will receive an invitation to the annual Dean’s Circle Dinner with Dean Larry Pulley and the School’s most generous alumni and friends. Members will also be recognized in online and print honor rolls and invited to other signature Mason School events on campus. The Class of 2019 can join the Dean's Circle with a gift of $500 now and a pledge to give $500 by June 30, 2020. Recent graduates (within five years) can renew at $1,000 by June 30 each year. Your entire Dean's Circle pledge counts toward your class gift. Include in the comments: "Mason School of Business 2019 Class Gift"
The Wren Bell has stood for centuries as a testament to William & Mary's longevity. Even when the university was forced to close its doors for lack of funds from 1881 to 1888, President Benjamin Stoddert Ewell faithfully rang the Wren Bell every morning to signal William & Mary's resilience. In the spirit of this bond, the Bell Society recognizes individuals who make gifts to the university in consecutive fiscal years. A recurring gift is an ongoing, specific gift amount that you determine. Set your class gift to automatically repeat monthly, quarterly or annually using the online giving form. With a recurring gift, you are helping the Mason School provide exceptional business education and ensuring steady, reliable funding for student and faculty initiatives. Using the online giving form, simply select your preferred Giving Frequency from the dropdown. The total annual amount of your recurring gift is included in the Class Gift total. Why should I make a gift to the Mason School? Your financial support of the Mason School ensures that the students who follow you will have the same exceptional education and experience you received. Additionally, publications that determine national ratings look at the percentage of alumni who give back to their alma mater to configure their ratings. Which means when our ratings go up your degree increases in value. Any gift to the Mason School counts towards the 2019 Class Gift Campaign. Gifts to the Mason School Annual Fund provide critical support to the areas of greatest needs across all programs. Gifts to the Mason School Annual Fund create opportunities for new initiatives such as the student marketing association, student career trek experiences in D.C. and New York City, and the global business minor. You may also choose to support your specific program or one of our scholarship initiatives. For a list of suggested allocations review the full list on the giving page. Can I make my gift in honor of a faculty or staff member, fellow student or family member? Yes! What a great way to say “Thank You” to someone who has encouraged your academic journey. When you make a gift in honor of someone, that individual will receive a tribute card notifying them that a gift has been made in their honor. *All tributes to professors are delivered after grades have been submitted. Philanthropy is a personal decision only you can decide how much you can afford and the value of the experience you have received. Any gift of any amount to the Mason School counts towards the goal of 100% giving. How can I join the Dean's Circle as a Young Alumnus? The easiest way to make a gift is online. If you wish to pay by cash or check, please mail them to P.O. Box 1963, Williamsburg VA 23187 or bring them to Miriam Fleming at 2046C. How can I make sure my gift has the greatest impact? Join in the global celebration of William & Mary and give your gift on One Tribe One Day, April 16th, when the whole W&M family comes together to give back and show their support of the university that means so much to them. Will my gift count towards William & Mary's Bell Society? Yes! Any gift to the university counts towards W&M’s consecutive giving society. My student loans will be coming due soon, doesn't that support the school? Tuition and fees alone do not cover the costs of the excellent education and opportunities that you received. Private support from alumni, parents, and friends allows the Mason School to invest in new programs and ensure that every student has access to co-curricular programming to enhance their classroom knowledge with real-world cases and experiences. Talk to your class representatives Jackie Palazzolo and Jared Bouis. Or contact Miriam Fleming, Associate Director of Development for Annual Giving at [[m|miriam.fleming]] or 757-221-2929.